Does your Birth Date Affect Your Flu Risk? Researchers are suggesting that the year in which you were born could be a predictor of your flu risk. 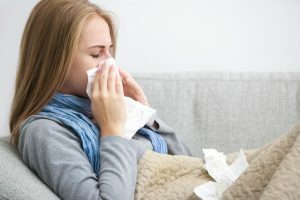 A new study looked at 1,400 people born in the year 1968 to find that they were less susceptible to a specific flu strain than those who were born before 1968. the researchers speculate this older group had more exposure to a similar strain when they were children. The populations they observed were mostly from Asia and the Middle East. In addition, the infections they examined were two strains of bird flu: H5N1 and H7N9. The researchers say that the new findings could help doctors actually predict which age groups are going to be at higher risk for infection from flu and severe illness in future flu pandemics. A “pandemic,” of course, is a widespread illness that infects a massive number of people. Lead study author Katelyn Gostic says, “In the past, we always assumed that when pandemic flu viruses emerge from animals, the human population is an immunology blank slate.” the University of California, Los Angeles (UCLA) graduate student in ecology and evolutionary biology goes on to summarize that they had originally just assumed that everyone’s immune system would simply be defenseless against a new, widespread flu strain. But the new study suggests just the opposite: that more people might actually be immune against a new strain of flu (from animals) if they had been exposed to a similar strain when they were children. In theory this actually makes a lot of sense; after all, this is a bit how vaccinations work. Furthermore, medical director of the Northwell Health Huntington Hospital, Dr. Michael Grosso, adds that this research is “a real step forward for the public health community and those tasked with protecting the population from influenza outbreaks—especially viruses like avian flu that jump from animal reservoirs to humans.